Tasmania is the latest state to declare priests will be required to report allegations of child abuse, even those made in the confessional, and could face criminal charges for failing to do so. Source: The Mercury. The reform plan has put the Tasmanian government at odds with the Church, which says priests must keep confessions secret. Tabling the government’s response to the Final Report of the Royal Commission into Institutional Responses to Child Sexual Abuse in Parliament yesterday, Attorney-General Elise Archer said careful consideration had been given to its 409 recommendations. The Tasmanian government has accepted in whole or in principle the vast bulk of the commission’s recommendations that lie within its jurisdiction and says it will give further consideration to all but three. Ms Archer said state laws would be reformed to provide greater protection to children. “Tasmania will be one of a number of jurisdictions in taking the lead in accepting in principle the need to include priests as mandatory reporters, and importantly to lift the veil from the confessional for the purpose of such reporting,” she said. 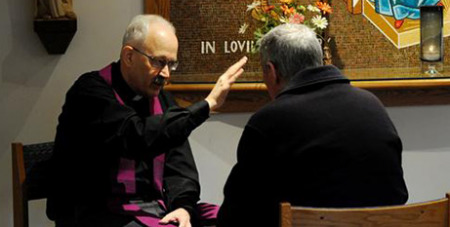 Hobart Archbishop Julian Porteous backs mandatory reporting but not when it means breaking Church law that requires priests to uphold the seal of confession, 9news.com.au reports. He said any allegations and suspicions of child or vulnerable adult abuse must be reported and acted on. "The Catholic Church in Tasmania has zero tolerance for the abuse or neglect of children or vulnerable adults and is committed to acting in their best interests," he said yesterday. He joined Catholic bishops across Australia in opposing any legal changes forcing the reporting of abuse revealed in confession, which under canon law would result in a priest's excommunication from the Church.